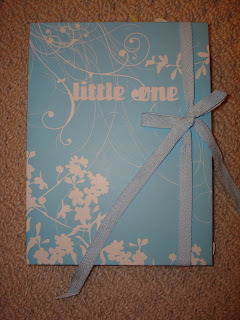 Just thought I'd show you a quick little baby book I made for my sister-in-law. She's due in early March, and her baby shower is this weekend, so I don't have photos or a name or anything, yet (I do know it's a boy). I'll have to add photos for them later. This is a cute little accordian book from Me and My Big Ideas that I got from Scrapbook Eh! last year with a simple sticker title. This was pretty quick and easy to make. I picked out some coordinating papers, (about 7 or 8 different colours or patterns), and some stickers and embellishments. I cut out my background sheets first, 8 6x8 sheets and glued them down and then made pockets or photo mats on all of them and then lastly went through with all of my word stickers, buttons, flowers, borders, felt pieces and what-not and finished it up.